In nursing homes throughout Louisiana, there are some issues that repeatedly arise every year. These issues concern the quality of care that is provided to residents, as well as the sanitation of food, maintenance of professional standards, development of care plans and maintaining a safe environment. Unfortunately, nursing homes in Louisiana have failed in providing safe environments for residents in previous years. Medicare maintains data on every nursing home nationwide from information gathered through inspections, surveys, and investigations. 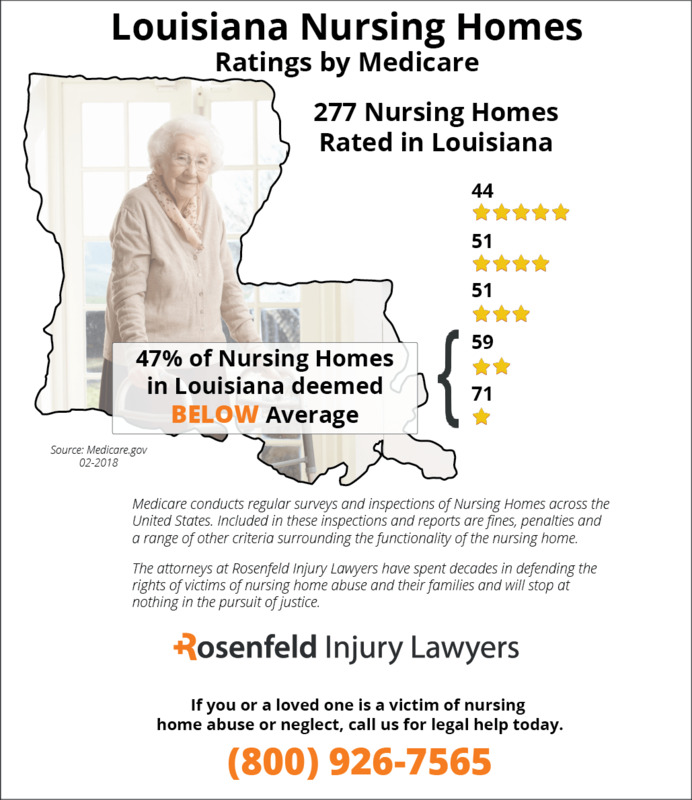 Currently, Louisiana has 277 nursing facilities of which 130 (47%) are deemed to have fallen below the national average due to providing substandard care after investigators identify serious violations and deficiencies leading to resident harm. 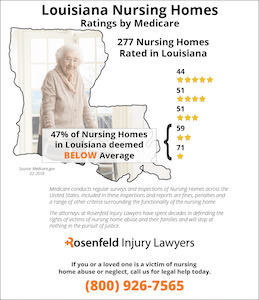 If your loved one suffered injury, was abused or died prematurely while residing in a Louisiana nursing home, we encourage you to contact the Louisiana nursing home abuse & neglect attorneys at the Nursing Home Law Center at (800) 926-7565 so we can evaluate your claim for compensation during a free initial case evaluation. 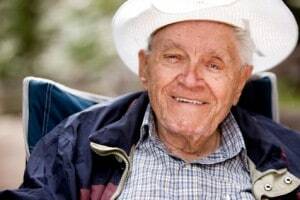 Statistics show that 44 percent of all Louisiana nursing homes fail to provide sanitary food to nursing home residents. In addition, 43 percent of all nursing homes have an accident-prone atmosphere that can pose great risks to residents. These statistics reveal that there is a need for lawyers to place continuous pressure on nursing homes so that they can improve their standards for residents in the future. Until the quality of care in these facilities is improved, a Louisiana nursing home attorney will continue to stand up for the rights of injured residents by filing lawsuits against nursing home administrators, employees and others. The main source of legal authority for nursing home neglect and abuse cases comes from the Abuse and Neglect of Adults Act. This act makes it a misdemeanor for anyone who fails to report the abuse of an elderly person and knows about this abuse. In addition, one who fails to make a report may be liable for a fine of $500 and imprisoned for up to six months. The Act also makes it illegal for any person, such as a nursing home administrator, to retaliate against a person who files a report with law enforcement. It one does retaliate, then he or she is also guilty of a misdemeanor, subject to a fine of $500 and may also be imprisoned for up to six months. As far as negligence is concerned, family members will have up to one year to file a negligence claim after they have discovered the injury of a loved one in a nursing home. This does not provide family members with a lot of time to resolve issues of abuse or neglect that are affecting a loved one. This means that family members should get in touch with a nursing home neglect lawyer as soon as possible to inquire about filing a lawsuit. There is a damages cap of $500,000 on the total damages that are available for a nursing home negligence case, but this excludes the cost of additional medical care needed. If your loved one has been forced to undergo additional surgeries or has required additional medical services, then he or she may be able to collect damages for the full costs of these services. In some of the most tragic cases, a loved one may die as a result of severe abuse or neglect. Family members can still have legal recourse under Louisiana laws if they have lost a loved one due to neglect or abuse. Family members will have one year from the date of the death of a loved one in which to file a claim. There is also a $500,000 cap on the total amount of damages that may be awarded to family members as a result of the loss of a loved one. Family members can still recover an unlimited amount for the medical expenses of a deceased loved one. Nursing home residents have a broad scope of rights prescribed by federal and state law. These rights include the right to be treated with dignity, respect and necessary care. Residents who are exploited for their financial resources are victims of a terrible sort of abuse. Those who suffer from physical injuries as a result of a worker’s dissatisfaction with a job are also victims. 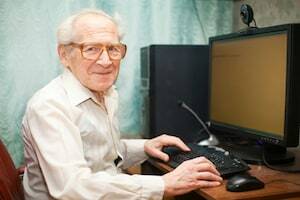 Stand up for your loved one by getting in touch with nursing home lawyers today. Take action now to end the abuse and neglect that your loved one suffers in a nursing home. Our lawyers are here to guide and support you in this overwhelming time. These highly susceptible pressure point spots tend to be common sites for the development of a bedsore (pressure sore; pressure ulcer; decubitus ulcer) when making contact with the bed or chair. The bedsore can develop in as little as two hours when the pressure restricts all or most oxygenated blood flow to the area. As the skin is deprived of oxygen, the tissue can begin to die or cause permanent damage. When the nursing staff at a medical facility conducts routine skin inspections, every pressure point on the patient’s body is assessed and evaluated. The inspection reveals any redness, inflammation or fluid filled blister of a developing pressure sore in its initial stage. If the sore is treated at Stage I, the inflammation and redness can disappear within a few days. However, if the inflammation, redness and blisters are allowed to progress into Stage II or Stage III, a shallow crater can form exposing fat deposits below in an open wound. In its most advanced stage (Stage IV), bone, muscle and tendons are often exposed in a deep crater increasing the potential of developing a serious, life-threatening infection. In many incidences, the patient will suffer death quickly from blood (sepsis) or bone (osteomyelitis) infection, especially when antibiotics are not able to overcome a compromised immune system. Nursing facilities and medical staff are duty bound to provide proper care to every patient to ensure any developing bedsore is not allowed to progress beyond the epidermis (top layer of skin). This is because once the pressure sore progresses into the deeper layers of skin, attending physicians often have limited options to heal the wound. Usually, debridement (cutting away dead or dying tissue) is necessary to minimize the pressure sore’s progression. It is essential that family members ask to review their loved one’s health chart. Reviewing details in the chart can ensure that the medical staff at the facility is doing their job and performing a daily skin inspection. Well-managed nursing homes will properly document the progress of pressure ulcers during every inspection. The notes will indicate if any abnormal condition was found on the skin including inflammation, redness or blisters. Because bedsores are preventable, any indicator of a loved one suffering a pressure sore is usually a sign of neglect by the staff. When bedsores are detected, it is essential that family members take immediate action by contacting a Louisiana pressure sore lawyer. An experienced attorney can offer family members various legal options to stop the neglect. In addition, the lawyer can file a claim or lawsuit for financial compensation to ensure the family has adequate funds to have their loved one treated effectively by medical professionals who specialize in treating advanced pressure ulcers. Fill out and submit the form here to contact an experienced Louisiana nursing home abuse attorney listed below who specializes in pressure sore cases. These law firms offer their services on contingency, where the costs of their legal services are paid through a jury award or out-of-court settlement in a claim or suit filed against the nursing home. They offer a free initial consultation to discuss the case and provide legal counsel on effective solutions to stop the negligence of the nursing home medical staff now.